Venezuelan president Nicolas Maduro, much like his predecessor Hugo Chavez, often appears on national television to address the country on the problems facing the nation and to boost approval ratings. However, during a television appearance in November 2017, Maduro made a very public gaffe that highlighted the growing corruption and inequality in Venezuela. During the broadcast, the president thought that the camera had panned off him after he finished his sentence and another speaker off-camera began talking, but the camera was still fixated on Maduro. As the camera zoomed in on his face, the maligned president stuffed his mouth with a huge empanada. Realizing what was happening, Maduro quickly hid his food and later resumed a speech preaching collective sacrifice and the importance of parsimonious spending in the face of one of the strongest economic declines in Venezuela’s history. To understand why this gaffe is so perturbing and malfeasant, it is necessary to know that a 2018 survey found that “89 percent of those surveyed saying they do not have the money to buy enough food for their families and 64 percent reporting they have lost an average of 11 kilograms in body weight due to hunger.” Furthermore, since Nicolas Maduro took power after Hugo Chavez’s death in 2013, Forbes reports that hyperinflation has reached over one million percent per year. This widespread hunger and inflation show the real human effects of economic declines. However, the roots of this economic crisis were sown well before Maduro’s inauguration. One of the biggest contributors to Venezuela’s collapse is the government’s reliance on oil revenues to fund social programs. Venezuela nationalized the oil industry in 1976 creating PVSDA to manage the country’s oil assets. For about 20 years, PVSDA was able to manage the assets and cooperate with international corporations like Chevron and ConocoPhillips. However, once Hugo Chavez became president, he routinely siphoned money from PVSDA and coerced private companies in order to increase revenues to fund socialist programs. Continuing Venezuela’s poor governance, Maduro has failed to take productive steps in alleviating the mistakes made by his predecessor as the nation is still reliant on the oil industry and mismanagement is still commonplace. 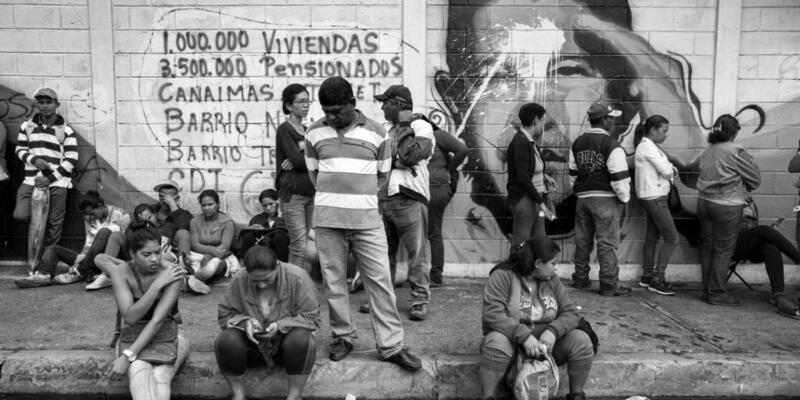 As the failures of the Chavez and Maduro regimes become more visible, Venezuelans are leaving en masse to find more stable lives in other countries, with about “ten percent of the population—2.6 million Venezuelans—hav[ing] fled to neighboring countries.” This collapse and huge migration have presented other Latin American countries with myriad questions surrounding the merits of socialism, and based off of recent elections, Latin American has decided step away from socialism and towards the right-wing. With the collapse of Venezuela during a socialist regime, leftist parties in other Latin American countries have struggled as right-wing politics have surged in the region as shown by the election of Colombia’s Ivan Duque and Brazil’s Jair Bolsonaro. of Bogotá, Gustavo Petro. During the first round of elections, both candidates were able to eliminate more moderate candidates on both sides which lead to a second round campaign that divided the nation. Duque, a former banker at the Interamerican Bank, plans to open up the nation to more investment. Ciro Meza of law firm Baker McKenzie said: “With the election of Ivan Duque the business sector, made up of both local and foreign investment, will see fiscal reforms that will seek a reduction of the tax burden for businesses and the simplification of administrative processes.” His plan is intended to avoid nationalization and maintain a business-friendly market for diverse industries while keeping social spending low. Duque’s fiscal policy is essentially the opposite of the Venezuelan model. On the other hand, Petro, a former leftist militant, has drawn many comparisons to Hugo Chavez because they share similar policies, particularly in relation to unused land owned by wealthy families. This comparison between Petro and Chavez is one that Duque has repeatedly made, and it has worked as more than 40 percent of Colombians fear their country could end up like Venezuela. On top of that, with a million Venezuelan refugees entering Colombia over the past few years, this comparison was particularly toxic to Duque’s bid for election. The increasing desperation in Venezuela and its effects on the perception of socialism in Colombia proved insurmountable for Petro and Colombia’s left-wing paving the way for a sweeping election for Colombia’s conservatives. In October 2018, Brazil elected a hard-lining populist right-winger, Jair Bolsonaro, with conviction over the socialist Fernando Haddad. Bolsonaro’s election marks a major shift to the right for Latin America’s largest nation as Haddad’s party, the Workers’ Party (PT), had won the last four elections, dating back to 2002. Brazil has recently been embroiled in one of the largest corruption scandals ever, which implicated many high ranking officials of the Workers’ Party, including the former president, and the Workers’ Party initial candidate for this election cycle, Lula. Despite being jailed for corruption, Lula was polling as the top candidate until he was barred from running by a Brazilian court. Thus, PT nominated Haddad. This left an open electoral field perfect for someone like Bolsonaro to uproot established politics. Challenging political norms was a defining feature of the Bolsonaro campaign and the challenges represent significant differences in the Brazilian candidates’ policies and worldviews. Bolsonaro’s campaign advocated torture, dictatorship, and martial law, in the name of public safety. Additionally, Bolsonaro has taken an extreme stance against Maduro and Venezuela. He “has strongly criticized the government of Venezuelan President Nicolás Maduro on a number of occasions, and his running mate, Hamilton Mourão, has talked about sending a Brazilian ‘peacekeeping’ mission into Brazil’s neighbor to the north.” Meanwhile, Haddad’s campaign struggled to shake Venezuela’s ghost and the claim that the socialist will turn Brazil into another Venezuela looms large. A task made more difficult as members of the PT have praised Maduro. This connection has pushed many voters, including a former PT voter, to support Bolsonaro because of worries of becoming the next Venezuela. The contrast in the connections between Venezuela and the two candidates is striking. Bolsonaro worked on people’s fears of a failing state while Haddad failed to distance himself from the socialist dictatorship in Venezuela. The crisis in Venezuela bolstered the Bolsonaro campaign and hindered the Haddad campaign, ultimately aiding the former’s election. With such chaos in Venezuela, it is understandable why people are scared of similar fates for their own countries. This fear has been an easy target for right-wing politicians across Latin America to capitalize upon and to use to label their leftist opponent’s policies as detrimental, unstable or even catastrophic. With such a powerful tool, politicians like Duque and Bolsonaro were able to win relatively easy elections in their respective nations as neighboring Venezuela floundered. What has transpired in Venezuela has had a substantial influence on the geopolitics of Latin America and will have lasting implications on the governance of nations throughout the region for decades to come. Posted in World and tagged Brazil, Colombia, Fernando Haddad, Gustavo Petro, Hugo Chavez, Ivan Duque, Jair Bolsonaro, latin america, Nicolás Maduro, oil, PT, Red Wave, Socialism, Venezuela. Bookmark the permalink.